Darlings, canines may be said to be a man’s best friend; but for the glamorous gal, it is not a four-legged pup frolicking through a field of just-bloomed yellow daisies that doubles as our BFF. Rather, the adorable pooch is trotting by our side, a close confidante as we whisper scandalous tales of heartache into his or her ear; whilst the basic tee-shirt is representative of our bestie. Given the fact that so is the case, it should come as absolutely no surprise that the basic t-shirt dress is every bit as desirable and needed within one’s wardrobe. And there is no more flattering or versatile piece as Elizabeth and James’ Cotton T-Shirt Dress. Proffering the very same sinewy goodness synonymous with the typical tee; the Cotton T-Shirt Dress is constructed out of 100% cotton, and harbors shoulder pads to give you that strong-shouldered look so common on the runway. Yet it is the sleeves – which reach almost to elbow-length – the chest pocket, and the round neck which truly give the style that kick of cool, simple, chic, sophisticated, casual oomph! Kittens, whether you realize it now or not, such a design is utterly essential for one to weather the sultry summer that is so fast approaching for it provides one with the easy, breezy, effortless design required for briskly bouncing along the boardwalk in Twelfth St. by Cynthia Vincent’s Tilla Flat Thong Sandals with Woven Cuff, a fun Eugenia Kim Erika Sunhat atop your head; yet retains the ability to turn elegant simply by pairing it with Report Signature Shoes’ Lorraine Cork Wedge Sandals and cinching a belt around the waist. But I digress; multifaceted in its aesthetic or not, the $245.00 price tag is not nearly as basic as the design itself. Luckily…American Apparel to the rescue! While lacking the padded shoulders of the Elizabeth and James pretty; for a mere $30.00 apiece, American Apparel’s Fine Jersey Short Sleeve Crew Neck T-Shirt Dress is just as covetable as it’s designer counterpart. And as an added bonus, it comes in six sassy colors – red, white, black, ash grey apricot, navy, and ash grey sea foam – making it simple to scoop up one in each hue to take you from the beginning of warm weather season to the very end! Thanks to Net-A-Porter and American Apparel for the pictures. I love the J Crew style. And the extra colors are very appealing. Oh summer, you are almost here! Great style! Comfy and timeless! I'm really loving this casual chic thing lol. In my opinion, comfort + style = smiles haha. Fab AA find, darling E! I LOVE the Elizabeth and James one but the American Apparel is such a great substitute! Love how versatile it is and how many colors it comes in. Definitely stick with the American Apparel version! Love the versatility of this! I love the E&J version but it seems a tad clingy for my figure (must work on the abs!) I'll head to AA for one of theirs! I am plagued with cravings to splurge but I definitely pick my battles. Love the t-shirt dress! The E&J has a better shape but I definitely wouldn't pay that much for this type of garment. The AA is a great alternative, but I'd probably pick something in the mid-range as I think this style will last forever! I know for sure that I would look scary in something like that,but the dress is really nice. Tightwad Tuesday..very cute, and spot on with this one for sure! so cool. i gotta invest in a belt. Either one looks like it might also double well over a pair of summer leggings? Beautiful outfit! It looks so comfortable and unique. So lovely! J Crew all the way! I am feeling a summer breeze coming from your blog... Lovely reds and the 2nd one is bang on budget! Great find, Erika. Hmm. This looks like it would go perfectly with my new leather-look leggings! Great post! I love hunting for bargains. I'm definitely in need of a splurge. That Elizabeth & James dress is to gorgeous. you are so right, everyone needs a basic t-shirt dress in their wardrobe. It would be easy just to stick some shoulder pads in the AA dress and make it look like the E&J one! $30 is a good deal! i think i'll splurge on this one! Love the deal for $30! Except sans the belt. This dress speaks for itself! I really like Elizabeth and James. The clothes are always so classic and chic. The shoulders on this dress are amazing. Defined, but not too big. Lovely! Oooh thanks for the tip! I usually think American Appearl is a bit pricey, but it really isn't that bad! I so badly want their body suits... Have you tried them? Do you know how true to size they are or how they work on tall gals like me? yeah I was going to say AA makes that style cheaper. I love the color though! Check out my blog , you will love it i hope . . . I'm a sucker for anything Elizabeth & James. But I love both options! American Apparel is the root of all evil, I swear! I can blow so much $ there!!! don't tempt me! AA has some amazing pieces for next to nothing. I had SO much fun in their store in NYC! I think the AA one would do just fine! That is a stunning outfit. Great for summer. Love the J Crew look. T-shirt...dress...you got me with those 2 words!!! Def the AA on this one! I love E&J but really that dress seems totally overpriced! AA for me! With all those color options and knowing that AA quality is pretty good, I have to go with the tightwad option this week. Always plagued with a craving to splurge. 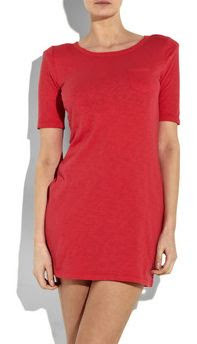 This t shirt dress is definitely very splurgable. AA for me! E&J seems incredibly pricey for that. amazing dress,i love that fashion style,make anyone that wears it so hott! that dress with a louis vuitton handbags is perfect! Great style..and I love red! Thanks! I think I might need to get that American Apparel dress. It's affordable and perfect for spring and summer! great! thanks for sharing. i LOVE american apparel- such great clothing. and fun.